Note to readers: Information on the story _Journey to the Center of the Earth_ and other works. 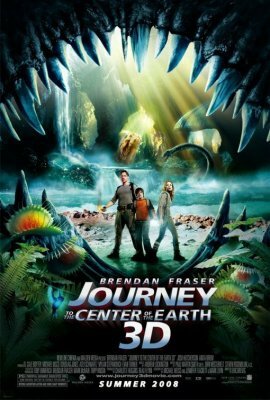 If you have seen the movie adaptation of JOURNEY TO THE CENTER OF THE EARTH (3-D) starring Brendan Fraser, or its sequel JOURNEY 2: THE MYSTERIOUS ISLAND (3-D) starring Dwayne “The Rock” Johnson, the North American Jules Verne Society naturally recommends you try reading the books that inspired them. If you are over 10 years old, we believe you are ready for the book as Jules Verne wrote it. He intended his writing to be read by all ages. JOURNEY TO THE CENTER OF THE EARTH has been one of the most popular books ever written for over the last 140 years, since it was first published in 1864. And there have been many adaptations of this tale made for the movies and television, one of our members, Brian Taves has written a comphrehensive article on the various	versions. Adapting Jules Verne’s Journey to the Center of the Earth. Jules Verne’s classic novel, The Mysterious Island, first published in 1874, is best remembered not so much as a castaway saga, but as the story that the drew the adventures of Captain Nemo to a close. In The Mysterious Island, Verne explains that Nemo was born an Indian prince, who joined the rebellion of 1857 against the British rule of his homeland. His family killed, he fled with a few loyal followers to the seas, building his fabulous submarine, the Nautilus. He then begins to take revenge against British warships at sea, as told in Twenty Thousand Leagues Under the Seas. 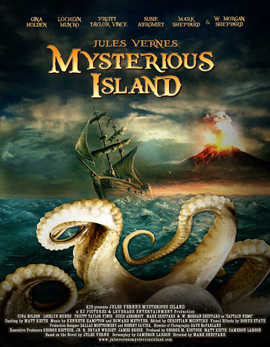 In early 2012, two new versions of The Mysterious Island have appeared on screen, one in movie theaters, the other on the Syfy Channel. 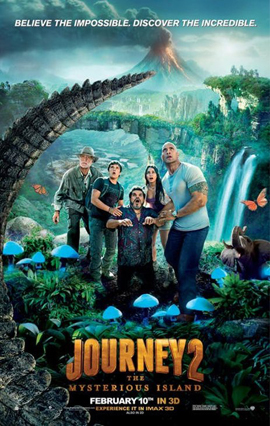 In particular, Journey 2: The Mysterious Island, an enjoyable sequel to Journey to the Center of the Earth 3-D (2008), incorporates elements of several Verne stories, not only Twenty Thousand Leagues Under the Seas and The Mysterious Island, and a bit of The Golden Volcano, first published in English in 2008. The Mysterious Island, and Twenty Thousand Leagues Under the Seas, were first brought to the movie screen in a 1916 silent epic, actually the first fiction film partly shot under the sea. Dozens of other versions of both novels have appeared around the world since, including many pastiches continuing the voyages of Captain Nemo. A major recent discovery, however, changes the way we know The Mysterious Island. In fact, it was a novel Verne had been working on for a decade, an epic entitled Shipwrecked Family: Marooned with Uncle Robinson. However, this version was rejected by Verne’s French publisher. He demanded it be entirely rewritten, starting from scratch. That new novel is the classic known as The Mysterious Island. Only a few incidents are similar between the novels; and all the characters are different. Shipwrecked Family told of a mother, father, and their young children, whose ship is seized by pirates, and castaway on a small boat, with only an avuncular old sailor to help them. By contrast, Mysterious Island begins amidst the American Civil War, as prisoners escape in a balloon carried on a storm to a Pacific island. In Shipwrecked Family, like Mysterious Island, the castaways must learn to survive with no resources outside of their own knowledge. Moreover, the flora and fauna of the island do not match the hemisphere, and there it appears that some of the animals have been used in scientific and biological experiments. 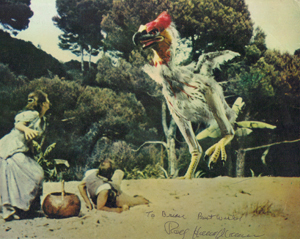 This was a theme added to the film adaptation of Mysterious Island in 1961 by Ray Harryhausen, and now that Shipwrecked Family has been published, it appears Harryhausen was more in tune with Verne’s original ideas than could have been guessed at the time. Exactly how Verne intended to complete Shipwrecked Family remains unknown, due to his publisher’s intervention—and there is no knowing if, as in Mysterious Island, Shipwrecked Family would also have included the end of Captain Nemo. Given just how close we now know Verne and Harryhausen were in their thinking, the North American Jules Verne Society dedicated their publication of to the special effects master. Shipwrecked Family is the second volume (of eight published to date) in an ongoing series of first-time-ever Verne translations, edited by Brian Taves for the Verne Society, and published by BearManor Media, and available on Amazon.com. All the books are profusely illustrated with the original 19th century engravings from Verne novels, and the cover is modified from one of the French first editions. Supplementing the story is critical background, including two essays by Verne about his enjoyment of “Robinson Crusoe” type stories. Expert translation is provided by Sidney Kravitz, also translator of the definitive modern edition of The Mysterious Island (Wesleyan University Press, 2002). Follow news of the series on our Facebook page “Jules Verne - The Palik Series,” while more information about the volumes currently available are found here. On 24 May 1863, which was a Sunday, my uncle, Professor Lidenbrock, came rushing back towards his little house, No. 19 Knigstrasse, one of the oldest streets in the old quarter of Hamburg. It is unfortunate that this inferior translation, because it happened to be the first one published in English, went on to become the “standard” English version of Verne’s novel and is still reprinted today by undiscerning British and American paperback publishers such as Signet and Tor. Much more accurate English translations of Verne’s Journey to the Center of the Earth include the following (all available in modern paperback editions): an 1876 version originally published by Routledge and reprinted by Bantam in 2006 (with an excellent introduction by Kim Stanley Robinson), an 1877 translation by Frederick Amadeus Malleson reprinted in 2005 in the “Barnes and Noble Classics” series, a fine 1965 translation by Robert Baldick published by Penguin Books and frequently reprinted since then, and a top-notch 1992 critical edition translated and edited by William Butcher in the Oxford “World’s Classics” series. — Professor Arthur B. Evans of DePauw University, author of numerous articles on Verne and the award-winning Jules Verne Rediscovered (Greenwood, 1988). Jules Verne (1828-1905) has been one of the world’s best-selling authors, translated in over a hundred languages. He has been beloved now for over a century for his imagination and story-telling skill. One thing about Verne you need to know. As a Frenchman who wrote in his native language, many of his stories were badly translated into English back in his own day. These versions continue to be reprinted. Further, many of these books are abridged. If you read one, you are not getting the full story (often 1/4 will be left out!). This is explained by New York University Professor Walter James Miller, a Verne translator and scholar honored by our Society. The Rehabilitation of Jules Verne in America: From Boy’s Author to Adult’s Author — 1960-2003. Here you’ll find a listing of Jules Verne’s works with links to more information including reviews by our members of various editions to look out for. You can find out more about Verne by visiting the various links on our website, starting with the About page.